Well this will be my last posting for the year. Its coming up on annual Christmas (summer) holiday time here down under so I wish you all happiness and good fortune over the next month while I’m basically a non-blogger. Consumption of the “The Water of Life” tends to go up at this time of year, so for those of you who like a sip or two, here’s a little something from Johnnie Walker to help pique your interests in pencils and whisky. I picked it up at a recent auction. The Johnnie Walker name and logo are printed on the barrel in gold. As is the by-line “Born 1820 – Still Going Strong”. 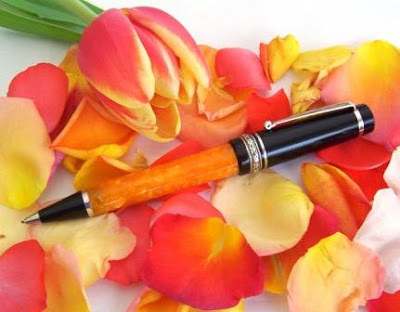 Now, pull the cap off that end, and put it on the other end and our fountain pen reveals that it is also a propelling pencil. You twist the tip to advance or retract the lead. Another old ad sent to me by Glen. This one is from the US magazine Esquire, April 1950. It’s for a Norma 4-colour pencil, a Norma Multikolor as they call it. Black, green, blue, and red. I don’t have a Norma so I’m not sure if the black was usually black, or “black lead” as in normal graphite. The sliders and tip look very similar to a couple of other old multi-colour pencils I’ve got. You push the relevant slider down to push out the tip you want, and then you twist the tip to wind the lead in or out of the tip. 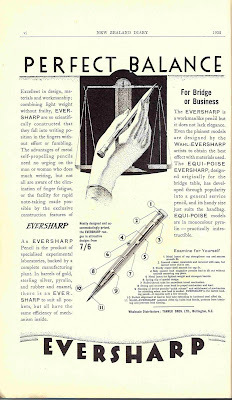 I don’t think their claim of “The Versatile Pencil of Tomorrow” ever really came true. Back when I put up my posting on the Caran d’Ache Fixpencil stamp, I wondered which eraser was depicted on the stamp. Roi commented that he thought the eraser was the Pelikan BR40. 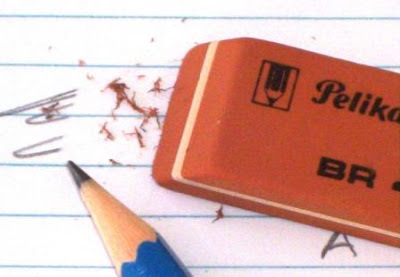 I didn’t know this particular eraser, and thought that the eraser depicted was a fairly generic style and thus there could be many possibilities. Roi, being a stamp collector, took up the challenge. Just which actual eraser is depicted on the Fixpencil stamp? Initial contacts with Swiss Post customer relations staff seemed promising, but in the end didn’t really achieve much. The Swiss Post website had some information relating to the printers and designers, but attempts to find and contact the stamp designer ended in frustration. So, despite Detective Roi’s dedication and best efforts, ultimately we have failed to confirm the exact eraser on the stamp. Roi kindly sent me a couple of these Pelikan BR 40 erasers, so here’s a few quick comments on them. Firstly they are a rubber eraser, with one end for pencil and one for ink. When he sent them, Roi commented, “use them gently – the orange end might stain the paper, and the blue one will tear it up!” Now that I’ve tried the eraser I think he was being a little hard on it. The BR40 is a mid size eraser – 60mm long by 20mm wide by a rather thin 8mm thick. The colours are a bit dull, but the black printing on the eraser is very good. It’s a reasonably hard rubber, the blue end does feel a little more abrasive than the orange end. Erasing HB lead with the orange (graphite) end it did a fairly reasonable job, although it certainly leaves its fair share of eraser waste behind. The blue end is for erasing ink, and I was actually mildly impressed. I haven’t got any real frame of reference for comparison, except I seem to recall that when I was back in primary school I thought these ink erasers were utterly useless. It certainly did do some abrasive damage to the paper, but it got the ink off. Perhaps modern inks are a bit drier and more erasable than the ballpoint inks of my school-days? Anyway, I started with rather low expectations of this eraser and was pleasantly surprised. 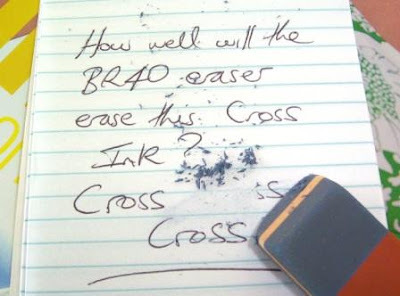 Photo: The word “Cross” was written in ballpoint at the end of the eraser. Just the last 's' is left un-erased. So, all that remains now is a lightning commando raid on Swiss Post headquarters, the Swiss Postmaster-General will be cornered in his office, and the truth will finally be revealed. Footnote: Pelikan are a big player in the luxury writing instrument market, and they have plenty of mechanical pencils. I’m sure you will be surprised to hear that I have a few Pelikans packed away downstairs, so I will have to get organised and get a few out for review. Rather bad of me to not have reviewed any so far. Footnote 2: Detective Roi has come up with another lead, stay tuned. I normally try to post something substantial every week, but the end of year rush and madness seems to have arrived early this year, so this blog is now officially on the back-burner until mid January or so. I do have a couple of postings that are almost complete so I will publish them over the next few weeks, but things will be a bit erratic. Some of the research material in my search for good blue and other coloured leads. Note the 8 different colours of Pilot Eno Color at the bottom of the photo. I’m generally predisposed to think of Italian products as being of superior design and quality. To date my only review of an Italian pencil has been the Parafernalia Revolution, which was not an entirely complementary review, and this has always left me with a sense of unfinished business, that there are other Italian pencils out there, and I should at least give Italy a chance to even up their scorecard. 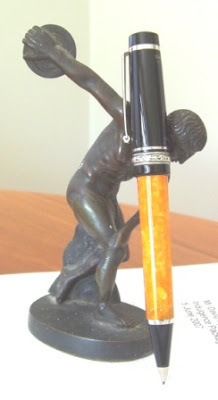 It is therefore with much anticipation that I awaited the arrival of my Delta Dolcevita Medium Pencil, and its use as my pencil of the week – or even longer! La Dolcevita – literally “The Sweet Life” or The Good Life as we more commonly say in English. Some might equate that to the saying about “Wine, women and song”. Now I’ve certainly got nothing against any of that, but there is plenty of the Good Life in other things, like for instance “Rugby, beer and pencils”! Just a note about the photographs in this review. I had a lot of trouble capturing the colour and contrast of Dolcevita, and consequently a lot of these photos make it look a bit washed out - lighter and yellower than it really is. In real life it is a nice bright medium orange colour. Very bright and sunny. Very attractive. First impressions then. The pencil arrives in a bright orange card box, about 155 x 140mm x 32mm thick. Inside the box is a plush presentation case which is covered in black velvet on the outside, and tan leather and black velvet on the inside. 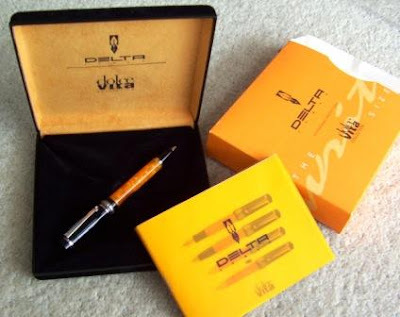 Inside the presentation case is the pencil, along with a small booklet extolling the glory of Delta and the Dolcevita collection – fountain pen, roller ball, ballpoint pen and mechanical pencil, all in several different sizes, e.g. small, medium, oversize, etc. I imagine I have missed out on another instruction sheet, as this Delta booklet seems a bit light on instructions like how to fill your fountain pen, change the rollerball refill, etc. More specifically, it contains no instructions on how to operate the pencil. Luckily I’ve owned enough pencils to figure it out, but I’d imagine a lot of folk would be a bit perplexed. Onto the pencil itself – well it’s pretty good looking too. Big solid shiny black resin cap with silver metal trims, bright orange marble resin body and black tip with metal trims. 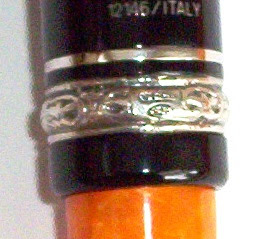 The black caps of Delta instruments are individually sequentially numbered, mine being number 12146 to roll off the assembly line. The main cap-ring is made from 0.925 sterling silver, hand engraved in reproduction of an old Roman décor featured in paintings from the ruins of Pompeii. There are also some hallmarks on the silver ring. This silver central ring really does look antique, and certainly reinforces the general air of languid opulence that hangs around this pencil. Although it couldn’t have actually happened, I have no trouble imagining Fellini using a Dolcevita to sketch scenes for La Dolce Vita, well you get the imagery anyway. Despite the lack of instructions, I can tell you this pencil is a twist action mechanism, you wind the whole cap around to advance or retract the lead. The whole cap also pulls off to reveal a small rubber eraser, and in turn the eraser pulls off to reveal the lead storage chamber. However, this is just storage, you refill the 0.9mm lead in through the tip like the pencils of old. How the average punter is supposed to figure this out I just don’t know, hence my suspicion that I missed out on some instruction sheet or booklet. The Delta website doesn’t seem to have any instructions, well at least not in any place I found with a quick scan through the site. The pocket clip is platinum plated, and features an actual roller at the end to help it on and off your pocket, providing extra protection for those expensive shirts and suits. Yes, it works rather well. As there is no protruding lead sleeve, the pencil tip is reasonably pocket safe. In the hand this pencil is definitely “substantial”. It’s a bit shorter than average, fairly heavy, top heavy, the cap is quite wide – all these combine to ensure you feel like you have a real handful of pencil, and the 0.9mm lead supplied glides smoothly over the paper. The resin body is very smooth and shiny, but the grip is still quite good. However, I imagine things could change if you were sitting at the caffé, sipping Campari, sweltering under the Mediterranean sun. I like the orange marbled body, but one thing I don’t like is that because the resin body is translucent, the lower part of it is darkened by the threaded section of the black tip screwed up inside the orange body. I feel sure they could have done something to keep the colour constant. Well, in conclusion, for a pencil, this is a nice piece of luxury or jewellery. I’m glad to own and use it. Best Points – This pencil definitely has character. 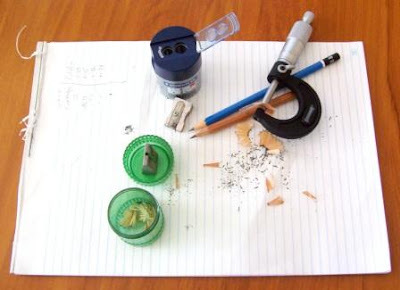 Not So Good Points – The lack of instructions about lead refilling, locating the eraser, etc. The discolouration of the orange body down at the tip. Dimensions – Length 138mm, diameter 11mm main body, 15mm at cap-ring. Balance point about 75mm up from the tip. I took my Dolcevita away with us on a holiday weekend as part of this Good Life review; maybe it brought us luck, as we got upgraded to the penthouse suite at the Hyatt. Swweeeet - the Good Life alright - our hotel “room” was pretty much the same size as our house, and it had more bathrooms! 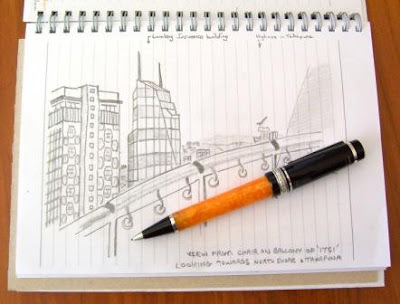 Photo - a page from my notebook, a quick sketch of part of the view from one of the penthouse balconies. There’s a lurker in the shadows. Pentel, Pilot, Papermate, Staedtler, Faber-Castell – all familiar names, all significant players in the mechanical pencil industry, along with many others I haven’t mentioned. Off to the side though, in the “peripheral shadows” of the industry there are the component and contract manufacturers, less well known names like Schmidt and Gutberlet. But also lurking in these shadows there is a giant, a “600-pound gorilla”, the mysterious Kotobuki of Japan. If Pentel are the leader, the big boy of mechanical pencils, then Kotobuki are probably the ones keeping them on their toes. Now, Kotobuki are one of those shy gorillas, so my knowledge of them is very sketchy and very limited. Much of what little I know is from “Japan and the Mechanical Pencil” (Dec. 2000) an Economics 230 paper by J Gregory, Colorado College. Web searches reveal a few other snippets here and there about Kotobuki, and my pencil contacts in Japan tell me that Kotobuki don’t even have a Japanese website. So, what do we know about Kotobuki? Well from 1976 to 2000 there were 167 United States patents granted that relate to mechanical pencils. 117 (70%) of these US patents were granted to Japanese entities, and the two largest of the Japanese were Pentel with 28 patents and…you guessed it, Kotobuki with a surprising 37 patents, that’s 22% of all US patents were Kotobuki’s, making them the biggest “patenter” by far. I found an online patent website, and looked up Kotobuki’s USA patents for the last 10 years (1997 onwards). From the patent header descriptions there were 15 Kotobuki patents for “mechanical pencils”, 10 for “double-chuck mechanisms for mechanical pencils”, 31 for “writing instruments” and 9 for “stick mechanisms”, e.g. 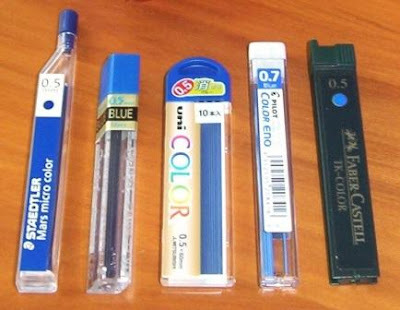 cosmetic or eraser sticks. The late 90’s and early 00’s seem to be the time of most double-clutch mechanism activity. Now patents certainly don’t necessarily equate to company size, but it does show who is busy trying to be inventive and innovative. You don’t keep all that R&D effort going for long periods of time if you aren’t a big player in the game. Trust me, on the list of patents most of the pencil brands you are familiar with are conspicuous by their absence or rarity. Back in 2000 or so, Kotobuki had about 150 employees, that’s about 1/10th the number of Pentel employees, but they were much more narrowly focused on pencils, so the size difference is exaggerated. Ever seen a pencil branded Kotobuki? Thought not. Well actually I’ve got one, but that’s a story for another day. Obviously the vast majority of Kotobuki’s output is sold under other peoples brandnames. 10 bucks says many a Papermate, Staedtler or whatever started out in a Kotobuki factory. In Malaysia though, there is the PENAC Group who are the Kotobuki distributor for SE Asia. Their website claims Kotobuki has 700 employees and produces 1 million writing instruments per day. Other business information sites list the brand “PENAC” as being owned by Kotobuki. In Europe it appears Standardgraph distribute some Kotobuki product. So, who knows who really makes what these days? Take a look at the Staedtler USA website and you will see they source a lot of their product from Staedtler Japan, but most of Staedtler’s other international operations don’t seem to have much Staedtler Japan product. Now, take a look at these two pencils (thanks Mark) – firstly the Staedtler-USA Elite 9705, made in Japan and now the Faber-Castell Grip 1335/37. Oh yeah, look familiar? (Anyone out there actually got both these pencils? Are they totally identical?) So did both Staedtler and Faber-Castell independently design the same pencil, did one copy the other, is one making it for the other, is a third-party manufacturer making it for them both…? Go looking elsewhere and you’ll find plenty of mix and match pencils, maybe even the “Staedtler 9705 – FC 1335/37” under yet more brandnames – take the pocket clip off that brand X pencil, put it on that brand Y one, and hey, it’s the same pencil. Or swap the end-caps over, and hey presto, two become one. So in many cases even though X and Y are both well known companies, either they didn’t make their own pencils or one of them is manufacturing for its opposition. Actually in most industries there are lots of contract manufacturers, and even the big boys buy some finished products from contract manufacturers and just have their brand applied to it. Sometimes decades of corporate deals and takeovers lead to crazy circumstances where a manufacturer’s exclusive agent in one country is the direct competitor of his agent in another country, and so on. Totally confused? – me too. Hmmm, lately I seem to be writing posts about stuff I don’t know, rather than about stuff I do know. Look, don’t ask me why, I can’t really explain it even to myself, but whenever I look at a German pencil and read “Made in China”, well, it just doesn’t sit right. Now don’t get me wrong here, I’m not implying anything about inferior products standards in China, nor am I necessarily against international trade and subsidiary companies…see I can’t explain it, but it just doesn’t strike me as “right”. Putting that nagging incongruity to one side, let’s have a little about the Grip Matic. Well, it’s a very lightweight plastic pencil, it surprises me nearly every time I pick it up just how light it is. Mine is a rather attractive fluorescent transparent green main body. It certainly stands out. The grip section is round rubber with grooves. There’s not much give in the rubber, but it is slightly “grippy”, so overall it does improve the grip. But its pretty marginal. The pocket clip is plastic, in a wave shape. Its quite good looking, but not quite so effective as an actual clip! Interestingly the faber-Castell website depicts a different pocket clip shape – a plain curved one. The twist out eraser is a feature of this pencil. It’s a fairly hard vinyl compound, about 4mm (1/6 inch) diameter with 9m of usable length. The twist mechanism is a little disappointing. The eraser doesn’t actually move in or out - the eraser is fixed and it’s the covering sleeve that winds up or down to expose or cover the eraser. I feel a little short changed by it - compared to other twist eraser cartridges this one is no where near as satisfying winding in and out, over and over in a boring meeting! Photo – eraser sleeve twisted out. Photo – eraser sleeve twisted right in. Note how it is visible back down inside the green body. You pull the eraser and sleeve off to access the lead refill chamber. My pencil is 0.5mm lead, but there is also 0.7mm available (the 1377!). The lead advance mechanism is an ordinary push top ratchet. 10 clicks to advance a might 12mm of lead. That’s a lot more than normal. The lead sleeve is a short tapering plastic cone suited for general writing rather than draughting work. The tip is retractable for pocket safety. 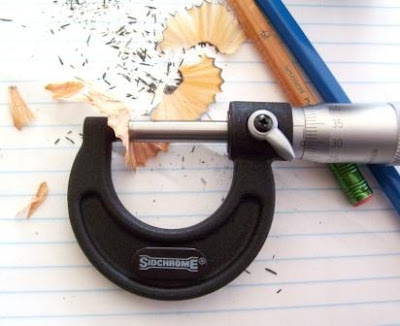 Despite all the lead clicking in the paragraph above, the Grip Matic is an automatic or auto-advancing pencil. When I’m using a pencil for review I keep a few notes to help write the review later on. Here’s one part of my notes regarding the auto-advance. “Auto-advance. It works. Really works. Feeds out smoothly – no “plunging” as with other auto-advancers. 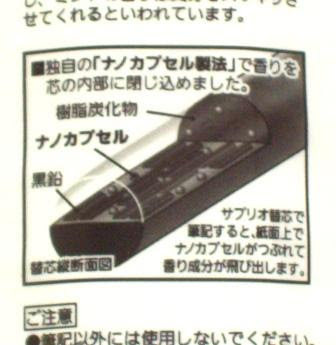 Lead sleeve is plastic – glides smoothly across paper – no dragging or scraping like some other auto-advancers”. Well, that’s pretty high praise from me. Unfortunately it didn’t last. Something happened and the dreaded “plunging” started to occur. It’s just so annoying. The whole tip sort of plunging back into the pencil, you just can’t write with any precision or constancy at all. Manually clicking mechanism to “start again” generally seems to help. Sometimes the plunging comes back, sometimes it doesn’t. So annoying, because when the auto-advance is working well, it’s great. One thing about auto-advancers is that they only allow a very minimal length of lead out of the tip, so lead breakages are very rare. Overall then, a little bit of a mixed bag. Best Points – The fluoro barrel. When it’s working well, the automatic lead feed is good. Not So Good Points – When it’s not working well, the automatic lead feed is not good. Dimensions – Length 148mm, diameter 10mm body. Balance point about 60mm up from the tip. Disclaimer – this pencil was a freebie from Cult Pens over in the UK. I’ve recently had a bit of thing going for coloured leads, and blue leads in particular, so I thought it was time to do my bit for “art”? I have accumulated a fair few different blue leads and now its time to put them to the test, in the “Great Blue Challenge”. Pilot Color Eno – 0.7mm blue. 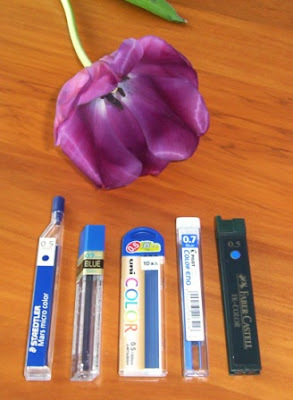 Faber-Castell TK-Color – 0.5mm blue. I feel it is my duty to uphold the Queen’s English and point out that, except for Pentel, every one of these foreigners have spelled “colour” incorrectly. Pentel have shown admirable judgement and avoided the word entirely! So first thing I did was a bit of general scribbling and doodling with the leads. The Staedtler lead is very weak, and wore down very quickly. I had to make sure to only advance a minimum amount of lead out the tip, not press too hard and hold the pencil perpendicular or the breakages were just too many to bother with. On the plus side though, it does lay down a fairly good solid darkish blue line. The Pentel lead is miles stronger than Staedtler and wears down much slower, but it lays down the lightest blue line of the 5 Blues Brothers. The Uni lead is also strong and slow wearing. Its blue is a somewhat different hue to the others. The Pilot lead is 0.7mm, quite strong as you would expect. It is also slow wearing. Seeing this is the only 0.7mm Blues Brother, I got out some Pentel and Uni –ish blue 0.7mm leads for a quick strength comparison. To my surprise, Pentel was the weakest, with Pilot and Uni being basically the same as each other. For the Faber-Castell lead just read my comments for Staedtler again, although their blue is a fractionally lighter colour. Next then a quick spot of erasing, using three test erasers – Staedtler Mars plastic (vinyl), Faber-Castell PVC-Free and Factis 36R (natural rubber). The results are rather similar for all three erasers, there’s no big difference to their performance, but if I had to choose a winner I’d say that the vinyl Mars plastic eraser was the best. There is though a big difference in the erasability of the different leads. The Uni is definitely the most erasable lead, erasing almost totally, similar to plain graphite lead. Next is Pentel and then the Pilot which both have good erasability but leave some residue behind. 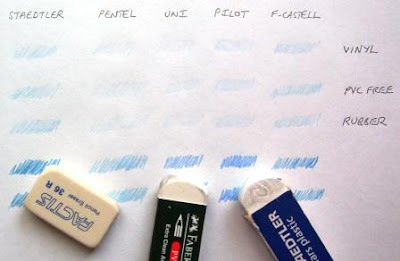 The Staedtler and Faber-Castell leads are considerably less erasable than the other leads, leaving a lot of blue behind, irrespective of which eraser used. Overall then, Staedtler and Faber-Castell are very borderline, getting close to being unusable because of breakages and fast wear, and having poor erasability. 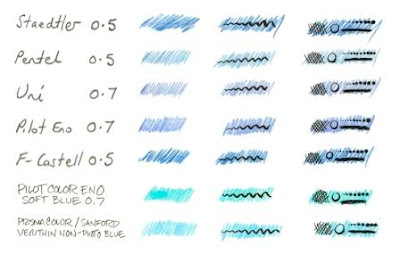 Pentel, Pilot and Uni are clearly superior leads, with acceptable strength so it’s mostly just a choice of which shade of blue suits you. But one Blues Brother must be the leader of the gang – colour, strength and erasability, for these reasons I choose Uni. Hi folks, Glen here to throw in my two-cent's worth on a comparison of the non-reproduction suitability of a number of different brands of mechanical pencil leads. What, you may ask, is non-repro? Well be sure to peruse this past post post haste to get up to speed on the nitty-gritty of the illustration uses of blue leads. Are you back yet? Good... we can begin. I started by scanning in a sampling of different blue leads kindly supplied by our host, and added two of my own. The Pilot Color Eno Soft Blue is the same lead as the Pilot Eno Blue provided by Dave, but, as the name implies, in a different hue. Much lighter and more turquoise. Lighter is b.... well, I'm getting ahead of myself there. More on that later. 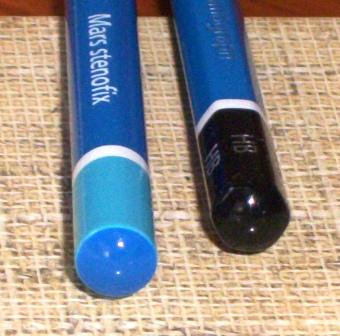 The Prismacolor / Sanford Verithin Non-Photo Blue is actually not a mechanical pencil lead at all, but a traditional pencil, and the standard to which I wanted to compare all others. If you want Non-Photo (the older name for non-repro) blue and like pencils - use this. But if, like me, you prefer mechanical pencils (and I think I'm safe in assuming such) then what comes closest? Read on fellow travellers and you shall see..... This first image shows the varying hues and darknesses of the different blue leads scanned in full colour. In itself not important (unless you're using blue lead for colouring purposes) but as we proceed you'll notice a correlation between the hue of blue (wasn't that a late 60's Pscyhe band?) and it's suitability for non-reproduction use. As well please note the black ink lines of varying thicknesses, strength and size. We'll use these as guides to the amount of blue remaining for each different type of lead. Our second image was scanned in the "Grayscale" mode. Grayscale scanning gives inked images a softer feel, with not only pure black and white reproduction, but shades of gray as well. I chose a medium setting for this test, with, as you can see, a wide range of results. The Prismacolor Non-Photo pencil has disappeared completely, as has the Pilot Color Eno Soft Blue. But all others show at least some pencil marks under their ink lines. The Pentel didn't fare too badly with the Uni following closely behind. Should you choose either of these leads it's probable that some adjusting of the Histogram / Levels / Brightness - Contrast controls on your scanner or in Photoshop (or whatever other program you use for image manipulation) would be able to remove most, if not all, of the remaining pencil. I'm afraid though, that the remaining leads I'd have to deem unsuitable for non-repro use in grayscale scanning. The Pilot Eno Blue (regular) and especially the Faber-Castell and Staedtler just aren't cut out for these parameters. The third image was scanned in Bitmap or Black & White mode. This method scans the image as either a black or white pixel, with no grey in between. Bitmap scanning works well when you want a crisp black line, suitable for paint bucket filling, and allows for a nice white background. Be aware that Bitmap images require higher resolution scans to achieve smooth lines though. Low resolution will show "staircasing"
Enough from Professor Flatbed and on to the test! 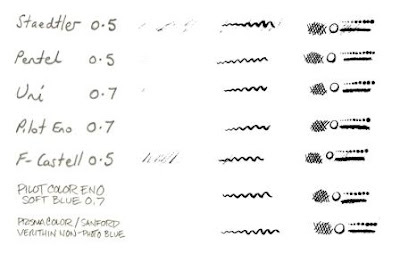 As you can clearly see Bitmap scanning is more forgiving to the blue leads, with three (The Prismacolor, Pilot Soft Blue and Pilot Eno) passing with flying colours (or should that be "flying black & white"!). Even the Pentel and Uni look good with only the slightest hint of pencil. The Faber-Castell and Staedtler are once again in the rear and apparently unsuitable in our task. Some adjustment of the Threshold level on your scanner is possible to help remove the remaining pencil, but there's not much leeway. Light Blue Lead = Good, Dark Blue Lead = Bad. Or put another way, and not taking into account pricing, softness / break-ability, erase-ability or lead size, I'd recommend the Pilot Color Eno Soft Blue, with the Pentel next and Uni third. I'm afraid the Faber-Castell and Staedtler just don't cut the mustard when it comes to Non-Repro use. I hope this helps if you were thinking of trying, switching to or experimenting with blue pencil leads. Give it a whirl - I don't use it for every job, but it sure comes in handy when you need it. Right, it’s Dave back again. After Glen and I prepared all the above, we noted that some of it was inconsistent with Glen’s comments to his original posting, namely the scanning properties and erasability of Pentel vs Staedtler. Clearly a little more investigation was required. It appears that heavy or light pressure when using the blue lead is an important factor. 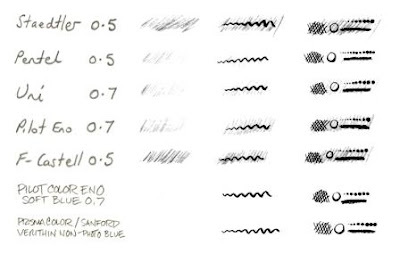 For scanning, Glen did some re-testing and is sure that when applied with light hand pressure, the scanning results are reversed to our heavy handed results above, namely with a light hand, Staedtler is better for scanning than Pentel. We both also did some more erasing tests. Glen felt at light pencil pressure the Pilot Eno Soft Blue erased completely, the Staedtler mostly, and the Pentel poorly. At heavy pencil pressure the Pilot Soft Blue still erased well, but the Pentel and Staedtler switched places with the Pentel faring slightly better, but both the Pentel and Staedtler erased poorly, the Staedtler almost not at all. Personally I felt that at light pencil pressure the erasability of Pentel and Staedtler were similar, but markedly improved upon their heavy pressure performance. One thing I did notice though, at light hand pressure the Staedtler lead felt miles better than Pentel. Smooth soft even Staedtler line versus hard scratchy variable Pentel line. Very surprising to a Pentel fan like me. Anyway, I guess what this all boils down to is that if you are using coloured leads you really do need to try a few out and experiment to find the best mix of paper type, hand pressure, lead brand and colour to give you the performance that you want. This is another full page advertisement from my “NZ Rough Diary 1932”. It’s a great ad, one of my favourites. Click on the image to enlarge so you can read it yourself. Check out the “perfect balance” of pencils “so scientifically constructed that they fall into writing position in the fingers without effort or fumbling”, the product of “specialised experimental laboratories”, yet even the simplest and plainest of these wondrous pencils are still designed by “artists”, far superior to us mere mortals. Read the tales of old in awe, for clearly the industry has gone backwards over the intervening decades. 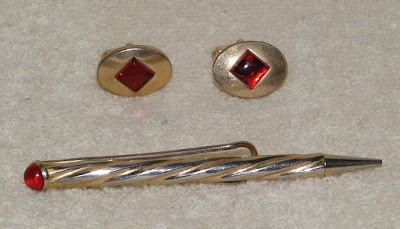 I recently got contacted by a reader who had purchased a mechanical pencil tie pin set at auction, and couldn't find a lead to fit it. Pentel 0.9mm is too small, and Retro 51 1.1mm (1.18mm) is too large. Supposedly it is a vintage tie pin, but he's not entirely convinced. So any ideas on a lead size and where to get some? Oh, I suppose I should mention it, a little milestone, sometime today my sitemeter will clock up 100,000 hits. Crazy. Feel Like You Need A Little Something? Feeling down? Need some rejuvenating? Pencil-pushing getting you down? Pentel have come to your rescue! 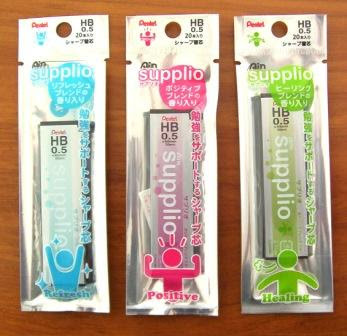 Ain “Supplio” aromatherapy mechanical pencil leads! Personally I’m not one who puts much stock in aromatherapy, and my nose is pretty useless. I’ve had some so called aromatic smell-able leads before and couldn’t smell a thing. Neither could anyone else who tried either. Cheap rubbish from China. 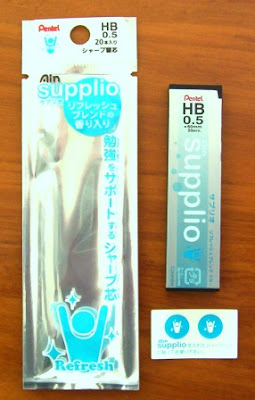 But these Supplio’s are a different kettle of fish, as you would expect from Pentel. Just open the foiled wrapper and a wave of scent slaps those nostrils. There are three fragrances – Refresh, Positive and Healing – as below. Sorry about the photo quality, but the reflective foil packaging is really hard to photograph. Here we have the package, lead container and little sticker. The leads just look like normal 0.5mm HB polymer graphite leads. I guess these two little peel-off stickers are for your pencil so you know what fragrance lead is in it? If I read Japanese, this stuff on the back of the package would be telling me all about little fragrance beads inside the polymer structure being released as the lead is worn away. If you had a good nose you could probably “smell” your writing as you wrote! Me, I have to stop and hold the paper up to my nose. I imagine this could get you some rather funny looks in the office. PS – Don’t ask me how to get some of these leads. A friend sent them from Japan. 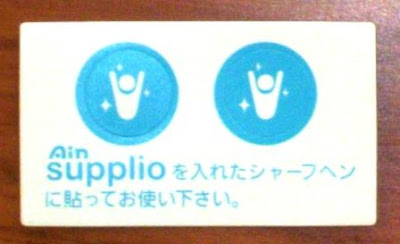 As far as I can tell they are one of the many “Japan only” offerings, with no easy online source for us foreigners. But feel free to tell us all how to buy some if you do know. 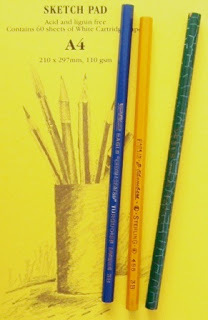 Up until now, my main posting on woodcase pencils has been my two “Wooden Weeks” where I used a different woodcase pencil each day. Well ever since then I have wanted to do a little more on my two favourites, the Forest Choice and the Mars Lumograph, particularly as the Mars Lumograph wasn’t ever reviewed over at Pencil Revolution. So, finally I got around to doing something about this and I spent a week using Forest Choice as my pencil of the week, followed by a second week using Mars Lumograph. Now I never claim to be an expert on mechanical pencils, and I have much less experience with and knowledge of woodcase pencils, but for what its worth, here are some of my thoughts on those two wooden writing sticks. For the purposes of review, I only used the HB grade of each pencil. One thing I really like about a brand new woodcase pencil is the length, so much longer than a mechanical pencil. A nice “wand” to wave around and make a little magic with J Forest Choice take the woodcase look to the ultimate. The wood is polished super smooth. I’m never actually sure whether there is some very light wood-polish or lacquer finish used, or whether it’s just natural wood with an exceptionally smooth finish. Either way, the feel of the wood is great. Also of course you get to enjoy seeing the grain of the incense cedar that this pencil is made from. It’s a great look, and fits in with what appears to be the marketing concept for Forest Choice. 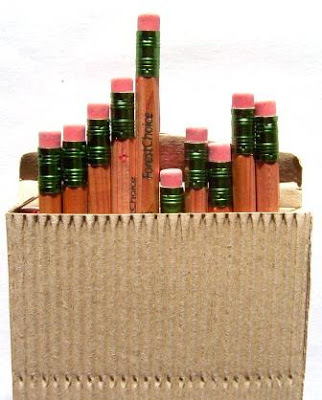 The name Forest Choice, the plain “natural” wood look, the certification by the Forest Stewardship Council, the plain corrugated cardboard packaging, obviously all combining to push those eco-green environmentally friendly type pencil buttons. At heart I’m a 0.5mm mechanical pencil type of guy, so I always have a few issues with the much thicker leads in woodcase pencils. I have found that I often hold the pencil fairly high up thus getting a low acute angle to the paper which helps keep the lead sharp. My weeks of using woodcase pencils have reinforced to me how important the sharpener is to woodcase pencils. So, I tried out a selection of sharpeners as part of the review, namely Staedtler 512 001, Dahle 53443 (both with plastic shavings containers) and a small KUM wedge sharpener. These three sharpeners had rather different characteristics in use. Firstly they all felt like they had a different “bite” on the pencil, with the KUM being the roughest, peeling the thickest layer of wood off the pencil. The Staedtler was similar, but the Dahle was very different, taking off a much thinner layer of wood, almost shaving rather than cutting or peeling a layer off like the others. The effect on the lead was also noticeable, with the lead being much less prone to having fractures or shattered rough sections when sharpened by the Dahle. This was all in line with my visual assessment of the sharpeners. Like I said, Dahle was very “gentle” compared to the others. All this sharpening does of course allow plenty of opportunities to get a whiff of incense cedar. In use, the lead of the Forest Choice is quite dark for an HB grade woodcase pencil. It is clearly darker then the Staedtler Mars Lumograph HB lead. Its about a B or maybe a 2B on the Staedtler scale. On the other hand, it is a little more smearable than the Staedtler HB. Some final words. The Forest Choice #2 is a great pencil, I really like it, but it’s not perfect. In particular, the leads seem to have a few quality control problems. They lay down a good smooth dark solid line when everything’s going according to plan. But…over the past few months I used three different pencils from three different packages bought at different times. With one pencil the lead was very prone to breakages, on another the lead had many hard inclusions that were annoying and very scratchy on the paper, and everything was “A-OK” with the third one. Link to the review of Forest Choice at Pencil Revolution. You can check out the California Cedar company and their products via sites such as Forest Choice, Timberlines blog, and CalCedar. 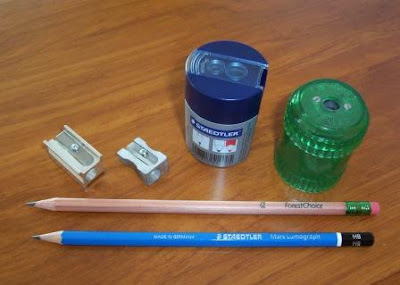 Staedtler are one of the heavyweights of the international woodcase pencil industry, and have been involved in the industry since its infancy. The Mars Lumograph is their flagship pencil, so you would expect a lot from it. Unlike the Forest Choice, the Mars Lumograph is usually sold untipped, well at least around here anyway. It has a smooth high quality lacquer finish – a mid blue for the main body with a white ring and black cap on the top. 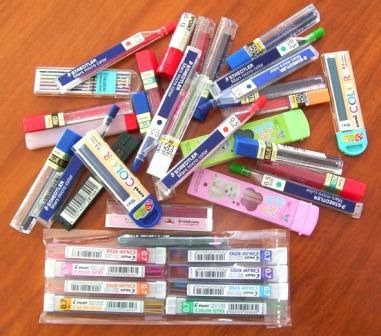 The Staedtler name, etc is printed on in silver, and barcode etc in white. It’s a nice look, but personally I prefer the Forest Choice au natural. Even though both Forest Choice and Mars Lumograph are both HB grade lead, they are very different. The Mars Lumograph lead is considerably lighter that the Forest Choice, but it is still very smooth, a little firmer, the point lasts a little longer, and it has none of the quality control issues I mentioned above with the Forest Choice lead. Not that the Forest Choice lead is weak, but I think Mars Lumograph is stronger. Photo: Box of 12 Mars Lumographs Photo: Check out the claim,"...unbelievably..."
Staedtler are a little vague about which wood they use for this pencil, but its much lighter in appearance and doesn’t have the aroma of the Forest Choice incense cedar. Also unlike the Forest Choice, the Mars Lumograph comes pre-sharpened. Check out the sharpening, look really closely, it’s a very interesting adze-sharpened look. 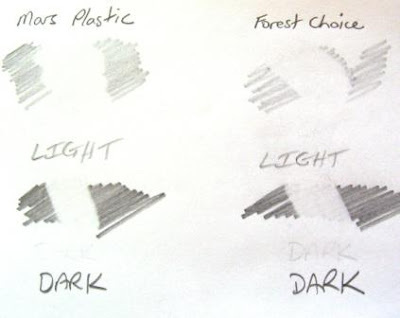 The Mars Lumograph sharpens quite differently to Forest Choice. All the sharpeners seemed to work a little better with the Mars Lumograph. The wood peeled off cleaner and smoother, and the lead was left in a much smoother clean state. Although I haven’t reviewed them here, the Mars Lumograph is available in a full range of lead hardness grades, unlike Forest Choice. Also there is a traditional stenographers round pencil version, the Mars Stenofix 101-HB. Same pencil, just the body is round instead of hexagonal. The dieing art of shorthand – in my first year at work, we had a secretary who took dictation in shorthand with a pencil. Cool. 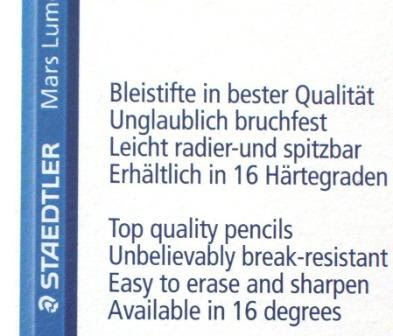 The Staedtler Mars Lumograph is another great pencil, although quite different to Forest Choice. Both are worth checking out. A tiny smidgen of success? Well just a few weeks ago I posted my little article Failure, not finding out much about government pencils. No sooner had I posted it than a local auction of pencils came up, and I won. So now I have 9 vintage NZ Govt pencils. The box is for Wolff’s Chinagraph Pencils and is thus unrelated to the pencils therein. There are three different ranges of pencil in the box. All are unsharpened untipped woodcase pencils. First is a round pencil, marked “VENUS copying, Venus pencil co limited, Made in England, No 200 Green” and on the other side “New Zealand Government”. It has a crazing pattern all over the green lacquer coating. I’m not totally sure, but I think this crazing is intentional, meaning it was painted that way for effect. Second is a yellow hexagonal pencil, marked “Made in England, J Chambers, Sterling, 486, 3B” and on the other side “New Zealand Government”. It has a very large diameter lead core, about 3mm or 1/8th inch. 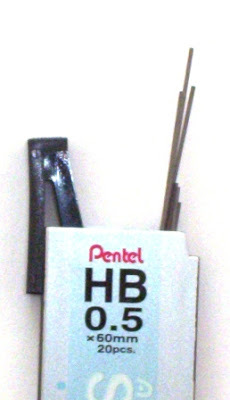 Third is a set of 7 blue hexagonal pencils, marked “EAGLE, ‘Chemi*Sealed’ Turquoise Drawing’ and their lead hardness, which on my seven is 6H, 2H, H (2 of), HB, B and 3B. On the opposite side they have “New Zealand Government”, and most also have “Made in England”. I assume that these were some sort of drawing or draughting set. 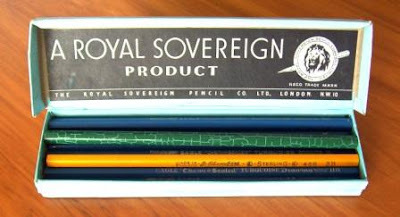 I’m sure government pencils ceased many decades ago, but I imagine they never actually sold any pencils, so technically I may well be in receipt of stolen property? If this blog suddenly goes off line then you’ll know why - those illegal pencil dealers dobbed me in to the G-Man.